The Pinellas County Commission has set a community conversation for Tuesday (May 3) evening. PINELLAS COUNTY – Residents are invited to join the Pinellas County Board of County Commissioners and the county administrator in a community conversation to discuss county services and important topics such as housing, social services and transportation. Held in partnership with St. Petersburg College and Bay News 9, the community conversation offers an interactive venue for citizens to talk about issues, with the convenience of social media, online video streaming and blogging. Citizen comments are encouraged as part of the conversation with Pinellas County commissioners Charlie Justice, Janet Long, Dave Eggers, Pat Gerard, John Morroni, Karen Seel, Ken Welch and County Administrator Mark Woodard. The event is scheduled for 6 p.m. to 7 p.m. Tuesday (May 3) in the Digitorium on the Seminole campus of St. Petersburg College, 9200 113th St. N. Commissioners will hold a meet and greet session from 5:30 p.m. to 6 p.m.
Be part of the live audience. The live event will be held at St. Petersburg College, Seminole campus, in the University Partnership Center Digitorium. Watch it live and blog on pinellascounty.org/CommunityConversation. The blog opens at 9 a.m. Tuesday. Watch it and ask questions on Pinellas County’s Facebook or post on Twitter and Instagram accounts using #pinellascc. Call (888) 409-5380 to listen and ask questions. Watch on PCC-TV (Bright House Channel 637, WOW! Channel 18 or Verizon Channel 44) or on SPC-TV (Bright House Channel 636, WOW! Channel 19 or Verizon Channel 47). For information about the Community Conversation, including links to resources about the county’s strategic plan and the citizen survey, call (727) 464-3000 or go to pinellascounty.org. 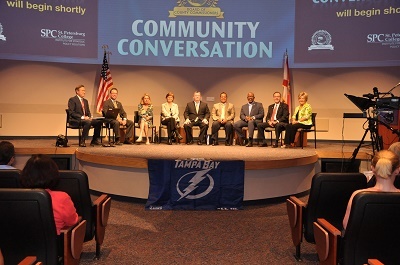 Photograph of 2015 community conversation and graphic courtesy of Pinellas County.